One of the leading science, history, and culture museums in the Midwest, The Grand Rapids Public Museum (GRPM) together with its strategic and creative partner Genesis Inc. will develop a new exhibition of the works of renowned photographer Paola Gianturco, author of Grandmother Power: A Global Phenomenon. Grandmother Power: A Global Phenomenon, a photography exhibit, is based on the book of the same title published by powerhouse Books and winner of the About.com Grandparenting Book Readers' Choice Award. The exhibition will feature images and stories of grandmothers worldwide who are acting courageously and effectively to create a better future for grandchildren everywhere. The show includes the stories featured within the book, of grandmothers in Canada, Swaziland, and South Africa who collaborate to care for AIDS orphans; grandmothers in India who become solar engineers and bring light to their villages while those in Peru, Thailand, and Laos sustain weaving traditions; and many more. Visit the museum's site for additional exhibition details here. We are grateful to the museum for the opportunity to join them in presenting Grandmother Power. Paola's book and this exhibition will redefine and challenge our assumptions about grandmothers. They are doing powerful, transformative work, acting as change agents around the world. We are honored to help shine a light on their stories and celebrate these incredible women. —Georgia Everse, Managing Partner of Genesis Inc. in Grand Rapids. 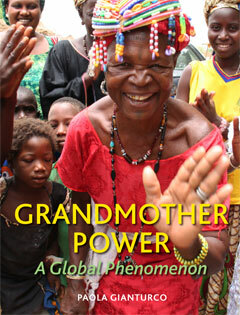 Please visit www.globalgrandmotherpower.com or view powerHouse Books' Grandmother Power page here for more information about the book. Hardcover, 8.5 x 11.25 inches, 256 pages, 225 color photographs. Additional review materials and high-res scans to your specification are available upon request; scanning from the book or lifting images from the mechanical file are strictly prohibited. Mandatory credit line: From Grandmother Power: A Global Phenomenon by Paola Gianturco, published by powerHouse Books.